Drop into the airsoft warzone effectively and affordably with the second generation of Lancer Tactical airsoft rifles. The Lancer Tactical Generation 2 MK18 MOD0 Carbine AEG from Airsoft GI features a newly upgraded, nylon-reinforced polymer body that makes it a tough, durable rifle and lightweight. It's so maneuverable, you can stay in the fight till you vanquish every last one of your foes. The gun has an adjustable front and rear sight, so you can dial in and zero your shots, and a flip-up rear sight. Attaching an optic is easy, because you can flip the rear sight down when not in use. 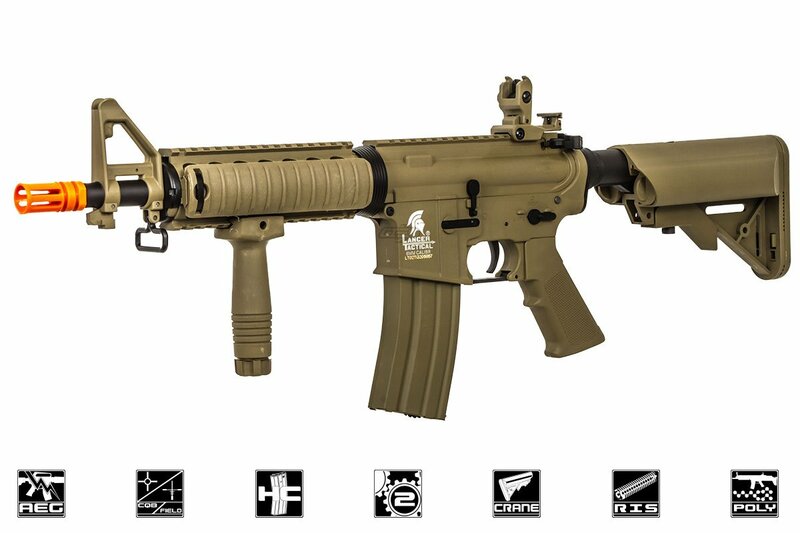 Available in your choice of black or tan, this carbine is a convincing replica of an MK18 MOD0. Its quad rail handguard lets you install your favorite attachments, such as grips and rail covers (included with this gun), flashlights, PEQ boxes and more. One sling loop in the front and a QD point at the rear of the rifle allow you to attach a sling to make the rifle even more comfortable to carry. Inside, the second generation of these Lancer Tactical guns is full of pleasant surprises. These carbines come with standard Version 2 gearboxes, so upgrades and modifications are a snap. The upgraded gearboxes include an upgraded motor, 8mm ball bearings to ensure the gears spin more efficiently with less friction, a quick-change spring system and low-resistance wiring to ensure dependable electrical flow from your battery to your rifle. The rifle also features a 6.03mm tight-bore barrel, and a rotary dial hop-up unit to allow for more precise, accurate shots at range. You will enjoy consistent groupings and great range with this gun. It shoots approximately 375 to 395 feet per second out of the box, making it field legal and perfect for long-range engagements. Best of all, these guns come with a high-capacity magazine, a foregrip and rail covers for extra comfort and maneuverability, a 9.6V battery and a smart charger. This would make a great gun for beginners looking to get into the game, a fine gift, an affordable loaner or an ideal back-up. It is so full of features that even veteran airsoft players might want to make it their go-to gun. 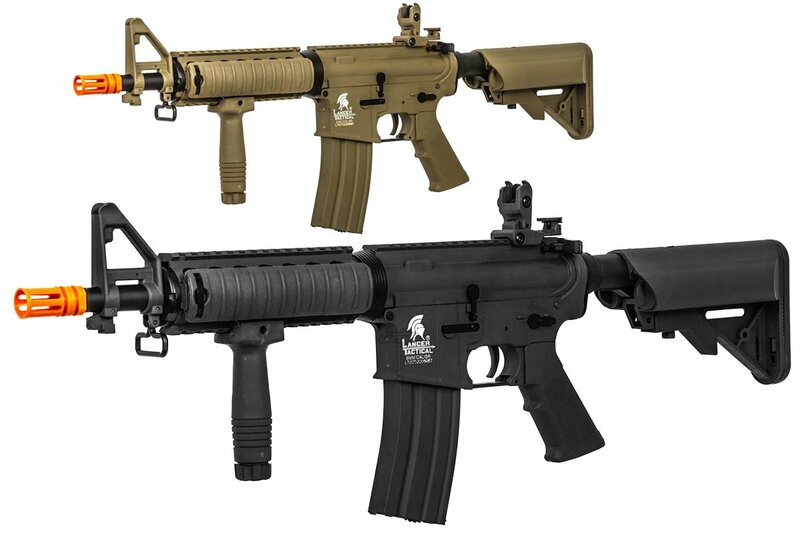 So pick one up and enter the fight with this impressive model from the second generation of Lancer Tactical M4 carbines. I purchased this gun to be my loaner gun or if I just wanted to mess around and get some trigger time and waste some ammo. I was absolutely astonished with how good it performed. It has a good weight too it and with the 6.03 tight bore inner barrel you really do get good consistent groupings at 150ft and maybe even a bit further. Lancer Tactical really did a tremendous job with these Gen 2's. So good that I reccomend them to anyone who is looking at a more than decent starter gun or a backup/loaner gun. When I bought it from ASGI there was a sale going on where I got it for right around $100. It is worth every penny and even though it has since gone up in price it is still a very good option under the $150 mark. When I bought this gun it was on sale for under $100 which is an amazing deal for this gun or any of the Lancer Gen 2's for that matter. I originally bought it to exclusively plink around with at home. Do some Target shooting and what not but it shoots pretty hard at around 380fps and surprisingly straight so I have actually used it at my local field for a few games and I have no problem getting hits at well over 100ft and over with it. The nylon polymer that makes up 80% of the exterior is decent. It definitely makes the gun lightweight. From what I gather it is far more durable than the first Gen LT's. Another huge plus with the Gen 2s is they all come with a very good 9.6 volt nimh battery and charger. I run is in my guns but I do keep 3-4 9.6's around as backups and the included Lancer Tactical battery is the best out of all them that I have. I highly recommend this gun to anyone who is on the fence about getting into airsoft. In my opinion there is no better all around package for the now $130 and under price. -Comes with a nice overall beginner package consisting of: A good quality 9.6 volt battery, charger with indicator light ,foregrip, rail covers, and a bag of good bbs (I believe about 600) to test the gun with. -Two piece outer barrel comes loose every now and then. Easy fix but still not annoying. -Back plate for the crane stock is flimsy and doesnt completely snap shut. Easily solved with some electrical tape but worth bringing up. -The polymer rail is flimsy and cheap. My guess is between it, The polymer stock, And polymer buffer tube is where they cut the most corners in bringing cost down. Made mostly of polymer, feels solid, fits the battery in with ease. Solid build, all polymer, solid easily adjustable hop-up, shoots really well. 300 Round fully metal magazine, feels super solid, slides into the gun no problem, pretty snappy full auto. Winged door for the battery is difficult to get off but should get easier over time, there is a small circle on the stock that is uncomfortable when aiming but shouldn\'t be an issue when I get my mesh mask. Most triangle sights are removable. Is the quad rail metal? If not what length of rail system could I install on this MK18? the quad rail is polymer. It would be replaced by any 7inch drop in quad rail, but some modifications for fitment may be required. Is this compatible with any mock suppressors? Typically 10.5inch styled rifles come with 280mm-300mm length inner barrels. Any other experience with this Airsoft Gun?? How does it work for field (No CQB)? These work great! They shoot very well and range out easily to 180 feet with good BBs.